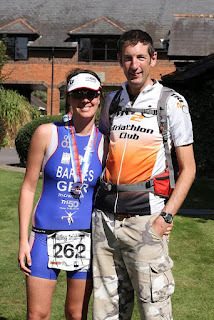 Triathlete, Ellie Barnes benefits from using sports hypnosis to help prepare for success in the Reading Triathlon. 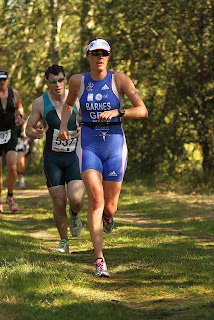 Ellie Barnes is a GB Age Group Triathlete and is also a fully qualified Personal Trainer and lover of all things exercise related. Ellie is no stranger to high profile events and has a long list of sporting achievements – London Marathon, climbing Mount Kilimanjaro and Mount Everest to name a few…. Like any athlete, Ellie knows the importance of competition preparation so prior to the qualifying event for the Team Great Britain Age Group for Sprint Triathlon, she decided to contact me at Christy Hypnotherapy to find out how hypnosis could help her relax and overcome pre-race nerves. After just a couple of sessions Ellie was able to put into practice the relaxation techniques to help her remain calm, reinforce her self-belief and stay focused prior to and on race day. Ellie successfully qualified for Team GB and will be competing at the World Championships in October 2012! On Saturday 8th September 2012 Ellie was again able to use these relaxation techniques to help her prepare for the Reading Triathlon, where she achieved a fantastic 2nd place. If you would like to find out how sports hypnosis might be able to help YOU, please contact Christy for a no-obligation discussion on 01252 334377 or email: christy@christyhypnotherapy.com. Go to www.christyhypnotherapy.com for more information.